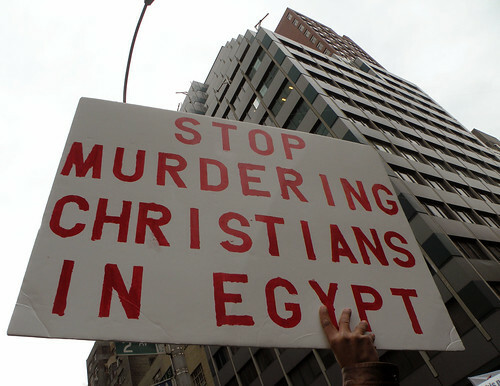 Persecution on Ex-Muslim Converts to Christianity in Egypt ! This is small segment of Persecution of Christians in Egypt documentary broadcasted by UK's channel 4. Michel Coren Show is a Canadian Show. A debate between Abdullah Kunde and Samuel Green. Granville, NSW, Australia. 10th of December 2010. ASSIUT, Egypt - A Coptic Christian priest has been killed in southern Egypt, triggering street demonstrations by several thousand Christians. The priest was found dead in his home. A fellow clergyman, Danoub Thabet, says his body had several stab wounds. He says neighbours reported seeing several masked men leaving the apartment and shouting "Allahu akbar," or "God is great," suggesting the killing was motivated by the divide between Egypt's Muslims and its minority Coptic community. About 3,000 protesters scuffled with Muslim shop owners Tuesday night and smashed the windows of a police car in the city, Assiut. With Egypt's "July Revolution" of 1952, for the first time in millennia, Egyptians were able to boast that a native-born Egyptian, Gamal Abdel Nasser, would govern their nation: Ever since the overthrow of its last native pharaoh nearly 2,500 years ago, Egypt had been ruled by a host of foreign invaders—Persians, Greeks, Romans, Arabs, Turks, and Brits, to name a few. After 1952, however, Egypt, it was believed, would finally be Egyptian. The revolution significantly Arabized Egypt. That Egypt's official name became the Arab Republic of Egypt—as opposed to simply the Republic of Egypt—speaks for itself. 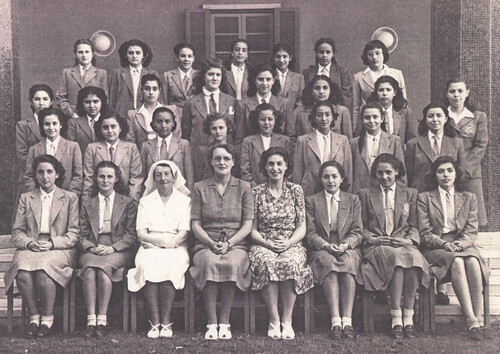 Whereas before 1952, one could have spoken of a distinctly "Egyptian" character and identity, after it, this identity gave way to an Arab identity. From there, it was a short push to an Islamic identity. Or, as Egyptologist Wassim al-Sissy recently put it, the revolution "erased the Egyptian character, which had been known for its tolerance, love, freedom, and so on. The revolution created a nation of slaves." David Wood has summarized some of the claims that Muslims use to show that Islam doesn't support violence. In the video on David's Blog, the guy comes up and says: "Here is the Quran, Show me where it says Kill the Americans". Muhammad commanded his followers to fight non-Muslims until they either pay the Jizya (in the case of Jews and Christians) or convert to Islam (in the case of pagans and other groups, or Jews and Christians who don't want to pay the Jizya). Muhammad was very clear on this point. Hence, Muslims are commanded to fight non-Muslims. America is filled with non-Muslims. Muslims are therefore commanded to attack America. But there are other reasons for attacking America. According to the Qur'an, Muslims are to fight anyone who "makes mischief" in Muslim lands. Qur'an 5:33—The recompense of those who wage war against Allah and His Messenger and do mischief in the land is only that they shall be killed or crucified or their hands and their feet be cut off on the opposite sides, or be exiled from the land. That is their disgrace in this world, and a great torment is theirs in the Hereafter. Since America is at war in Muslim lands, and interfering with Muslim governments, and an ally of Israel (which Muslims regard as Muslim land), the United States is guilty of "making mischief" in Muslim lands. Muslims are therefore commanded to attack us. Here again, Anjem Choudary pushes Sharia on the west. Just to note, this guy doesn't even know how to read Arabic or understand it. 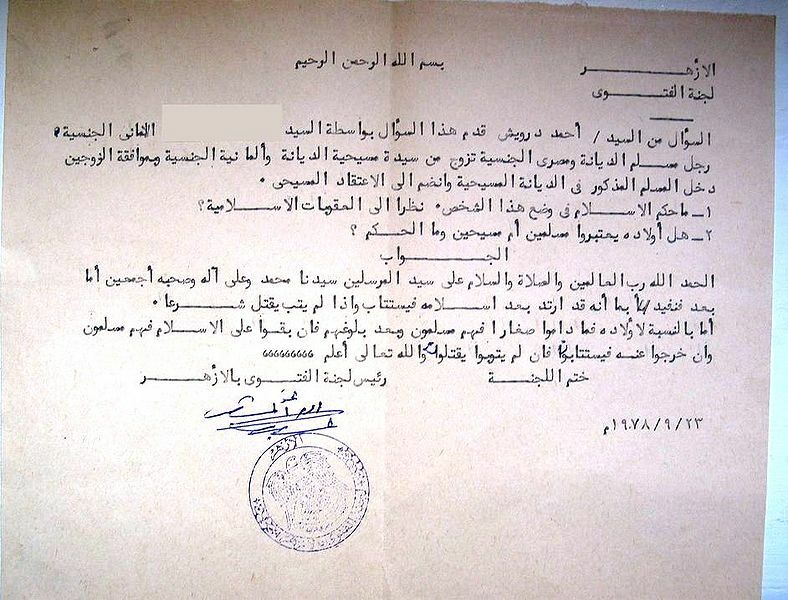 "Called for a large number of Egyptian intellectuals, who represent different generations, the need to amend Article II of the Egyptian Constitution which stipulates that 'Islam is the state religion and Arabic the official language, and the principles of Islamic Sharia the main source of legislation. The signatories to a statement released today that this claim comes from keen on the principles of democracy and national unity, see Egyptian intellectuals signatories to this statement according to their political affiliation and religious '.. 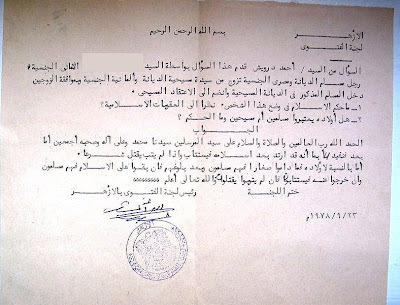 It was suggested that the signatories of the statement inspired by drafting the old 1923 Constitution of Egypt, which Article III where the 'The Egyptians are equal before the law .. They are equal in the enjoyment of civil and political rights and be subject to duties and overhead costs, without discrimination on grounds of ethnic origin, language or religion ', as stated in Article XII that' freedom of belief is absolute"
ABN Debate: Would Sharia Help the West? Another great debate from ABN Debate Night: Would Sharia Help the West? Debate between David Wood and Anjem Choudary. 1975: Attacks on the brutality of the Muslims during Ramadan celebrations and cracking shops Christians and the Church of the angel in Assiut. 1978: Iatdaet and killed with knives for some Christian students Boiade Islamic groups in the Assiut. 1980: Islamic groups got used to the Christian students living on campus in Alexandria. 1981: Attacks on the Muslim Brotherhood and Islamic groups and Christians on the police in the governorate of Assiut. 1981: The bloody attacks on the Copts in the red corner and killed 86 Christians and the attack on the hundreds of houses and shops. 1981: Asyut massacre that claimed the lives of hundreds and the slaughter of the Coptic police officers. **Note that the following event are a sample of the recorded events in the era of Mubarak. Many other events were not recorded like the kidnapping of many minors to be converted to Islam. 1990: Bloody events for the loader - Manfalout - claimed the lives of 6 killed and 50 wounded Christians. 1990: Burning of agricultural land belongs to the Christians in the Bulaq Dakrur because of a common construction of a church. 1990: The attack on the Copts in Abo Kerkas. 1990: Manfalout bloody events and the number of Christians killed. 1991: The massacre of 13 Christians Copts in the village in Assiut Mansheya. 1992: Massacre in which 14 Christian Copts in the village of Mansheya - Village Wissa - Dirout Assiut. 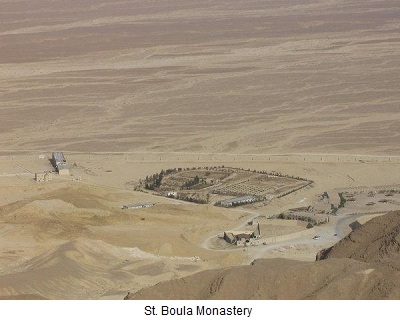 1992: Killed 4 of the Copts and the looting and theft, sabotage and chaos pass surged. 1993: Attacks on Muslims of the Copts in the city of Asyut. 1997: 9 Copts killed in front of St. George Church in the village of Property. 1997: 13 Copts killed and six injured in the entire estate of the village of Takla Bahgourah Center Nag Hammad. 1998: First Kosheh massacre in Sohag and killed Copts and put their bodies on the outskirts of the village. 1999: Killing of Christians from the Church of St. George in Heliopolis shot dead by Islamic groups. 2000: Second Kosheh massacre and looting of houses of Christians, killing and slaughter and burning of 19 Copts in front of their families. 2002: Muslim attack on the Church of the Virgin Mary in a village in Minya. 2003: an Islamic guerrilla attack on the village mound center of Al-Giza. 2003: Muslims kill Coptic Nama Malak Sahfiek using Police-issued gun. 2005: Muslims attacking churches and Coptic Christians in Alexandria and injuring dozens. 2005: kill a Coptic lawyer Sabri Zaki, strangled and then received from the balcony of his office. 2005: Barbaric attacks on shops and houses of the Coptic village of Kafr Ibrahim safety of the "Church of Abu Seven" center Qamh East. 2006: Diffusion of road accidents that kill clearly Christians. 2006: The bloody attack on the worshipers Coptic churches of Alexandria. 2006: Displacement of 15 families from the village of Coptic Hegaza tribal center Qus Qena. 2006: Incident the deadliest against the Copts in the village of Kafr safety eastern region. 2006: Beheaded one of the Copts in Aswan. 2006: Slaughter of a Coptic employee in Qena. 2006: Islamists kill the young man Mamdouh Hanna ElNemr in broad daylight in Deft El Laben area. 2006: Muslims occupy a Coptic house in the Nag Hammadi and steal all his possessions. 2006: Murder of Deacon Joseph Isaac in the province of Minya after the threat that should not go to Mass. 2007: Police helps in the attack on Christians in Deir Mawas and bloody persecution against Copts, some injured and the destruction of homes and shops in the village of Ayat Bahma. 2007: Harassment of Copts after Friday prayers Ba'eqat north of Luxor. 2007: Muslims attacked the Church of the Virgin. 2007: State Security arrested the correspondent of Christians United in Egypt without charge. 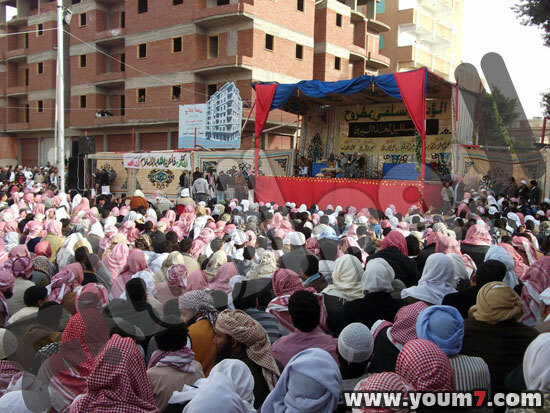 "Matrouh governorate witnessed the largest conference ever held in the presence of the Salafist Group for their leadership and Matrouh governorates of Alexandria .. Never in the conference, which is the first of the group any problems despite the absence of full security, where there were more than 5 thousand people to attend the conference about the events of 25 January and the position of the constitutional changes and the emphasis on adherence to Article II of the Constitution and try to activate after being trapped for more than 30 years"